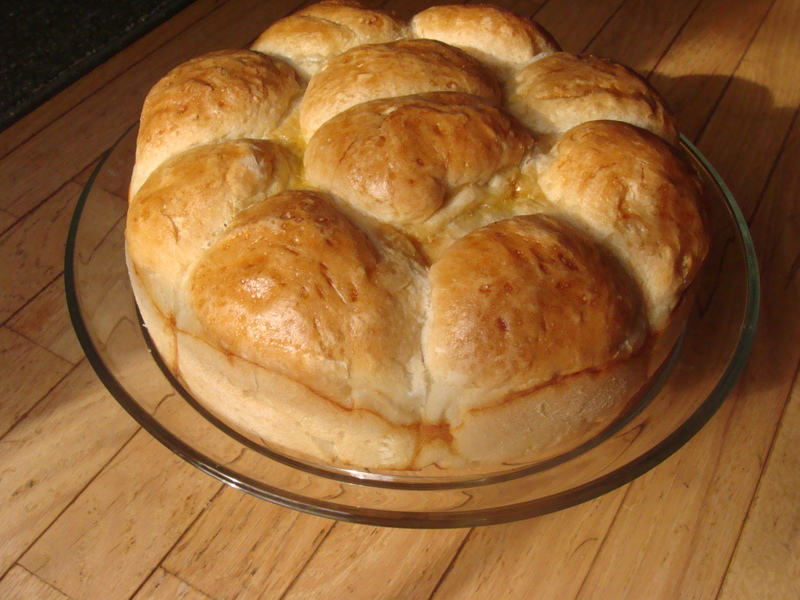 This is a celebratory bread that Macedonians (and other Balkan Peoples) use when they celebrate weddings, Saints Patron days, baptisms, etc… I speak for most people when I say that you will love sinking your teeth into this soft piece of bread! I baked this just the other day because it was my Grandmother’s Saint Patron Day, St. Dimitri – we could not stop eating it. This time I did not use the sesame seeds because my one year old loves this bread and I was afraid that she might choke on one. So, if you don’t want to use them, you don’t have to – this bread is awesome even without the seeds. Combine yeast, sugar, salt and 1/2 cup lukewarm water in small bowl – let stand 15 minutes. Put the flour in a large bowl; make a well in the flour and add oil and yeast mixture. Mix until dough leaves sides of bowl. Add additional flour if dough is too sticky. Divide dough into 6 to 8 balls (personal preference). Inside of a round, 8 inch baking pan, put the dough balls one next to another, forming a flower; leave the dough to double in size – about 20 to 30 minutes. Smooth oil over each ball of dough and arrange the sesame seeds on top of the entire bread. Bake at 400 degrees Fahrenheit for about an hour. Hi. Mom made with eggs and let rise overnight. She punched down dough a few times throughout the night for muliple rises to get the fantastic long flaky texture of the bread. Her pogachas rose extremely high and very lovely. Many folks asked her to bake for weddings. I’m going to give your recipe a try though out of curiosity. Looks so easy. Doesn’t pogaca usually require eggs? Also, would it be ok to proof it twice?